There is no shortage of management books on the market. Unfortunately, too many of them are just old concepts repackaged. The buzzwords are changed, the examples updated, but no real new insights are presented. So it’s refreshing to see a book like Spiral Up that really challenges commonly held perceptions of how things should be done. Linder offers fresh ideas, but more important, she backs those ideas up. There are no rock stars in this book. The author promises that. No explorations of the “big names” in management. No examination of already thoroughly examined “best practices.” Instead, Spiral Up: And Other Management Secrets Behind Wildly Successful Initiatives seeks to explore the most impressive victories of everyday managers, people you’ve likely never heard of, whose leadership changed their businesses. First, readers are urged to “make a difference” and “reach beyond your grasp.” Too many managers, she contends, aim simply not to fail and miss the chance to create a big impact. Your best hope for success lies in becoming personally invested in a project that challenges you. She advocates, in short, a leap of faith. Readers are next encouraged to “make space” and “step off the edge.” According to the author, much of conventional management wisdom relies on strict guidelines and order: set clearly defined goals, define the process and assign roles. The leaders of the “wildly successful initiatives” she champions, however, are willing to buck strictures and find what they need as they go. They guide, but don’t necessarily dictate. They set high expectations, but are not rigid about how those expectations should be met. The next crucial dynamic as identified by Linder is to “get it right.” To do this, it’s necessary to “learn by trying.” Uncharted territory, by definition, has no guidebook. That doesn’t mean, however, that one should just press forward blindly. Unconventional ideas often necessitate unconventional creation and implementation processes. Wise managers seek out the “right” solutions and are unwilling to settle for those that are merely “good enough.” They look for the simplest way with the most impact. Now it’s time to “energize people.” Linder urges the reader to “create a strong emotional field.” Resist the temptation to stock your project with experienced pros; the most engaged workers are often those tackling something new. The importance of teamwork should be reinforced with ample praise and credit given for individual contributions. With those points taken care of, one can now “spiral up” and get things done. “Wildly successful initiatives” don’t always follow the linear path favored by conventional managers. They require more intensity, more momentum and more freedom to develop. They are dynamic, ongoing processes that expand to meet new demands as time goes on. Throughout the book, Linder offers examples of these “wildly successful initiatives” and the people who shepherded them. For example, she spotlights Jim Schaefer’s work at BP. When the company sought to close its unprofitable Lima, OH refinery, Schaefer led the charge to keep the doors open. With the help of employees and community leaders, the plant not only met all their goals, but exceeded them and became a model of success. A wide range of initiatives and industries are covered, from maintenance to large-scale technological initiatives. Even public projects, like the Environmental Protection Agency’s AirNOW program are explored. Detailed time-lines are provided so that readers can follow a project’s progress and get a feel for its scope. Additional charts and graphs help to flesh out some of the project’s more technical aspects. There is no shortage of management books on the market. Unfortunately, too many of them are just old concepts repackaged. The buzzwords are changed, the examples updated, but no real new insights are presented. So it’s refreshing to see a book like Spiral Up that really challenges commonly held perceptions of how things should be done. Linder offers fresh ideas, but more important, she backs those ideas up. She goes beyond simply offering case studies for illustration and gives actual statistics to show precisely how “wildly successful” some of these initiatives really are. The tone is often conversational, the stories inspirational. 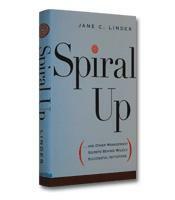 Spiral Up is a well-researched, well-presented book that will prove useful to readers open to bucking conventional wisdom.